Midweek Matchzone n°21 is now up on PhoenixFM website. 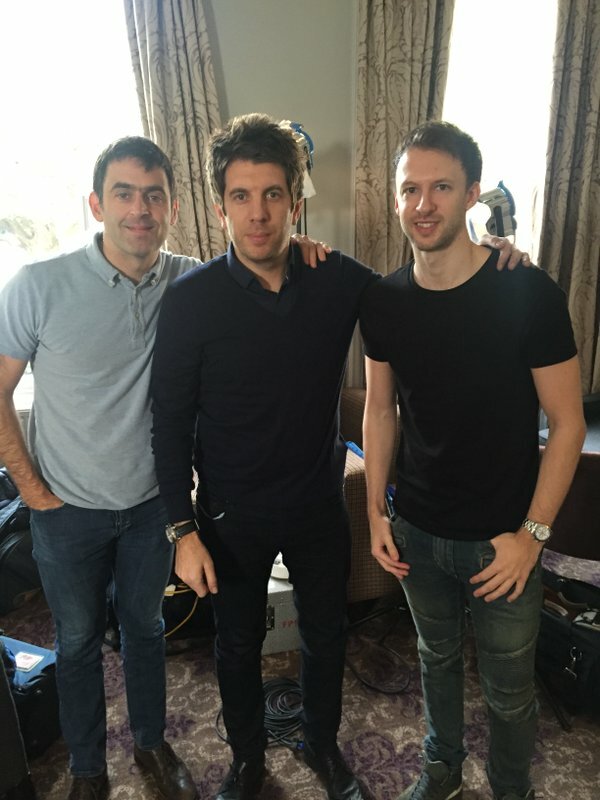 Chris and Ronnie are talking Haining Open, Winter football, the future of sports broadcasting, FIFA reform and the latest Premier League weekend. Also, if I remember well the idea of interviewing players between frames was used in the Senior World Championship a couple of years back. The audience loved it and the players who were miked looked comfortable with it but … I’m not sure this would work in a full ranking event were careers are at stake. 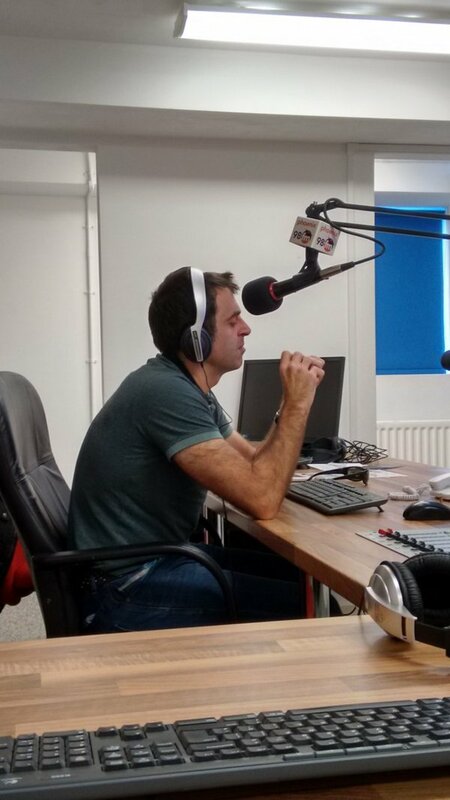 Sporting great Ronnie O’Sullivan will try his hand at expert analysis when the prestigious UK Championship begins on Eurosport in November. The Betway UK Championship, snooker’s first Triple-Crown event of the season, gets underway next month however it will be without defending champion O’Sullivan. The five-time winner is currently taking a break from competitive snooker, and instead will be part of Eurosport’s daily studio providing analysis alongside Jimmy White and host Colin Murray. This will be O’Sullivan’s first experience of tournament-long punditry adding to the exclusive “Ronnie O’Sullivan Show” already broadcast on British Eurosport. The five-time world champion will be the only noticeable absentee, with the rest of snooker’s top players expected to compete. The tournament is considered second only to the World Championship in prestige, regularly attracting sell-out crowds at the York Barbican venue. RONNIE O’SULLIVAN will not defend his UK Championship title next month as his sabbatical from professional snooker continues due to private unresolved personal issues. It is fashionable for those in the public eye to live their lives like an open vein while people they’ve never met provide a running commentary from afar but O’Sullivan has a right to keep his business private, even though he knows it will lead to wild speculation. 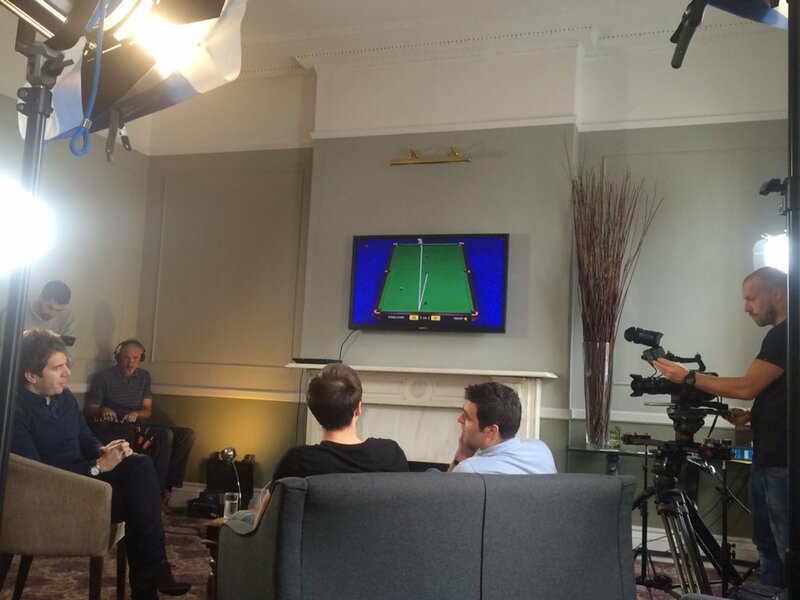 When he will return to playing action remains to be seen but as he has not entered the tournament he will be taking up a studio punditry role with British Eurosport, for whom he already presents a snooker magazine programme. O’Sullivan would rather be playing but the studio work is perhaps a portent of what is to come. After all, he turns 40 during the event. Not even he can stay at the top forever. O’Sullivan also withdrew from the 1998 UK Championship when defending champion and missed the 2012 event when he was taking a season off. That ended with him winning a fifth world title but he has suffered some high profile defeats since. He has also had some notable successes, in particular at the first two stagings of the Champion of Champions and at last season’s UK Championship, when he beat Judd Trump 10-9 in a thrilling final. He has been playing regularly, and impressively, in exhibitions but there is nowhere near the same level of pressure present on those occasions as in a big championship. O’Sullivan is the game’s leading box office attraction so his absence is disappointing for the tournament but by no means a fatal blow. The event, like any other, depends on the quality of the snooker played as much as the personalities involved. However, new stars need to emerge to keep the general public interested. With O’Sullivan a non-starter, York represents a chance for someone else to take the spotlight. O’Sullivan has his detractors but most will hope he does return to action and soon. There’s been no shortage of controversy during his career but it is far outweighed by his achievements. He will surely talk a good game from the TV studio but he can still play one. It’s just a question of when the king across the water returns. David is a British Eurosport commentator and the main assistant editor at Snooker Scene, working with Clive Everton for years. It’s good to see him expressing his opinion – a measured and well thought one as always – after some very nasty comments I have read on social media about Ronnie’s decision. Thanks Dave. The deadline to enter the tournament, which begins on 24 November, was 28 October, but the 39-year-old five-time world champion has declined to enter. He has not played in a competitive match since losing 13-9 to Stuart Bingham in the quarter-finals of the World Championship in April. O’Sullivan beat Judd Trump 10-9 in last year’s final to win his fifth UK title. This month, O’Sullivan also announced he would not be defending his title at the Champion of Champions event in Coventry, which begins on 10 November. The UK Championship, which is broadcast live by the BBC, is one of snooker’s ‘Triple Crown’ events, along with the Masters and the World Championship. O’Sullivan’s withdrawal will disappoint many fans of the popular competition, which is staged at the Barbican Centre. A spokesman from World Snooker, the sport’s governing body, said they were still expecting “a great event” and that ticket sales were “extremely good”. Should be a great event and loads of fun and laugher! During the election campaign 2015, Ronnie expressed his support to the Labour Party and, in particular, to Ed Miliband. Apparently, a common interest in cue sports provided the “glue” to this “a priory” unlikely friendship 🙂 . As we know, the Labour lost the elections, and Ed Miliband stepped down from his leader position … but the friendship stayed. 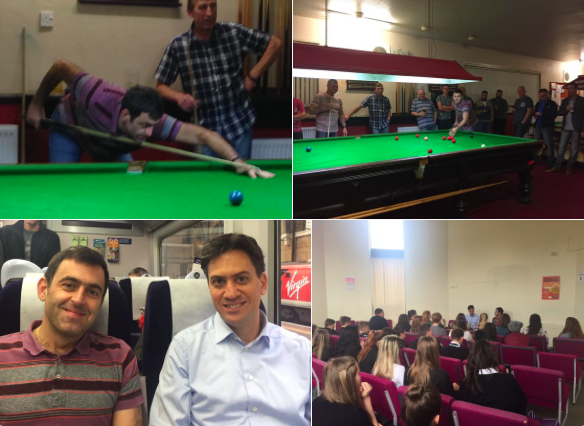 Yesterday Ronnie was in Doncaster with Ed Miliband and visited the Don Valley Academy, where he met the pupils, spoke about sport psychology and answered their questions. “Never give up and work hard was his main message. Later Ronnie was in Askern Miners Welfare where he played some of the members and was apparently unbeaten on the night (Peter Roscoe wasn’t around then? 🙂 ). Going by the reactions on twitter, it was a great night at the club, and Ronnie was very friendly and relaxed. “Never stopped smiling” said a fan in his tweet. Today he’s expected to visit Ollerton Town FC.